Optimized for high-performance execution and rapid debug, Assertion-based VIP consists of libraries of assertion-based verification intellectual property (IP) for exhaustively verifying the compliance of a design under test (DUT) to a given protocol. With our Assertion-based VIP, you can find critical bugs early on and shorten your overall verification schedule. All of our Assertion-based VIP are optimized for high-performance execution in our formal engines and ProofGrid™ technologies, along with rapid debug with our unique QuietTrace™ technologies. The VIP also works with our unique Visualize™ capability for early integration of your implementation and the kit and/or rapid protocol customization/extension. The VIP includes reusable “Recipes” to explore protocol functionality and intent based on interface events. The protocol-related properties generated support early exploration and verification of protocol specifications, are optimized for formal, and plug seamlessly into the simulation environment. In the case of ARM® protocols, all of Cadence’s ARM-related Assertion-based VIP products are ARM certified and optimized for high performance with our formal engines and debug workflow. 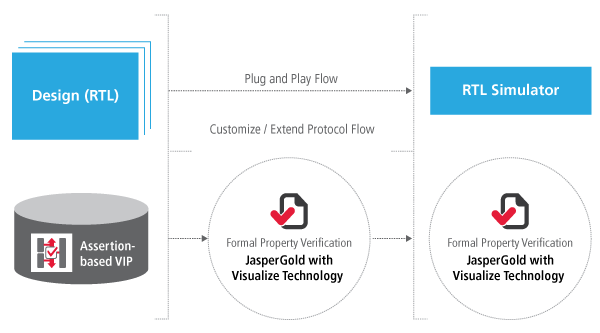 Each VIP offering works with our JasperGold® Formal Property Verification App to formally prove the embedded properties. As a result, you won’t need to manually write properties. The VIP also works with many other JasperGold Apps. When an Assertion-based VIP is used with these apps, you can visualize protocol transactions and timing diagrams to understand behaviors of properties as well as design specifications via our Visualize technology. Using the Assertion-based VIP with the JasperGold Formal Property Verification App eases debugging thanks to powerful Visualize technology that displays “live” interesting waveforms. If a counter-example is found, constraints can be added or modified on-the-fly using Visualize technology. QuietTrace technology simplifies the debug process even further, calculating the minimum signal activity needed to describe the behavior in question. This greatly accelerates your exploration and debugging tasks.